There will be some interesting visiting vehicles including a return visit by 1966 Red & White Bristol MW bus U1766 from Essex, 1969 Red & White RE UC169 Motorway Coach will be coming from Swindon and the “other” 1964 Western Welsh AEC Reliance Harrington Grenadier Coach No 145 from Kent, coming over to see it’s sister 147; amongst others. We are getting additional support from the Swansea group this year so there will be an excellent turnout of Welsh vehicles. On the cars front we have a full turnout by the Glamorgan Classic Car Club and also down to come again is what is now that 102-year-old Model Ford T dependent on a long journey from central mid Wales. Back to buses we have the usual free heritage bus trips with the former Newport Scania 141 open topper getting its first outing to Merthyr Tydfil since preservation. Another first, as this time it is now a CTPG vehicle, is the return of the 1960 Hills of Tredegar Leyland Leopard – thought to be the oldest Leopard in existence. 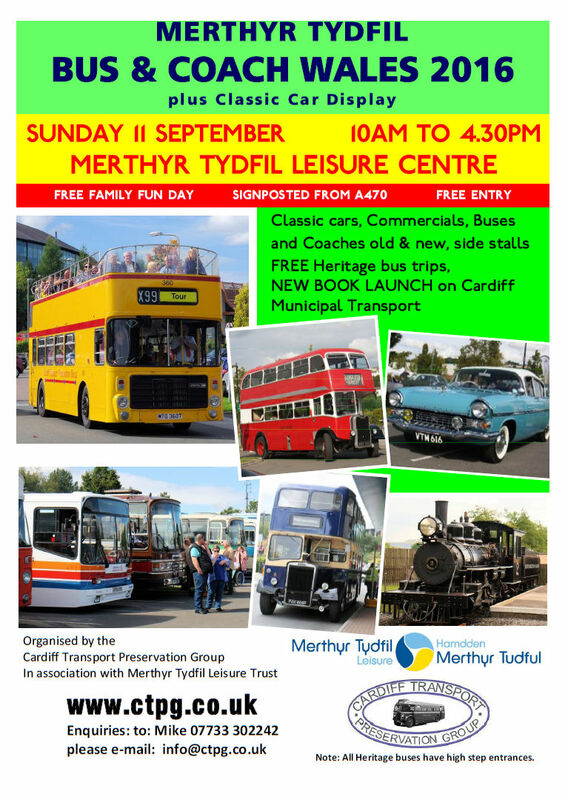 Cardiff buses are not forgotten as there is a NEW BOOK LAUNCH at the event for “Cardiff Municipal Buses” by Andrew Wiltshire. Today’s operators are also attending with modern day or interesting buses and coaches. We do hope you can come along. Please tell your friends as there’s lots to see and do at this Free Entry event. Event Guides will be available on the day at £2 and the theme this year is 30 years of Deregulation. If you were around on D-day 26 October 1986 – I am sure, you will have stories to tell. If you run a bus or coach and you want to come along don’t forget to contact Mike Taylor on mikeystrad73@btinternet.com. If you have fellow co-workers you can print the colour poster out (also works in black and white) to pop on the notice board. 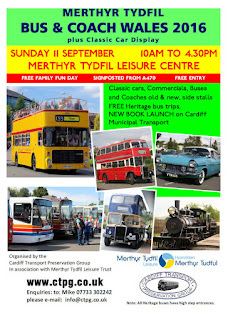 Its very much a family fun day with double deck and open toppers on the runout list for free heritage bus trips. See you in MERTHYR TYDFIL, SUNDAY 11th September 2016. THE DAY BEFORE is a Severn Bridge 50th cavalcade & celebration of the opening of the first road bridge and the original Red & White Services Ltd joint Bristol Omnibus Company bus service: 300 and 301 that started the day after the (first) Severn Bridge opened. Heritage buses are involved. If you want to know details, please contact Jonathan.Radley@btinternet.com You may also know him from his day job as the countries only truly nationwide integrated travel product offering - buy bus travel with your train ticket - the PlusBus Director. I am aware TV coverage is being sought but I don’t know how far things have got and I think there is some involvement by modern motorway coach service operators, as it appears to be THE celebration for the 50th anniversary of the Bridge. It must be said THE SEVERN BRIDGE does look magnificent even if its newer sister takes most of the traffic these days.